"When I saw her coming down the road carrying her little black bag I would get so mad. I thought she was bringing a baby to our house and I sure didn't want another one to tend to. I would be tickled to death when she went on by," laughed my Aunt Helen Starnes as she recalled a part of her childhood. Those were the days when grown children believed babies were delivered in satchels. And the lady she was referring to was my great grandmother, Anna Hill, a widely known and respected midwife. Known affectionately as Granny Hill and Aunt Annie, but most often referred to as "Scissors" because of her profession, she is said to have delivered as many as a thousand babies during her lifetime. She kept meticulous records of all the births but unfortunately the journal cannot be found. That ledger size journal contained the names of youngsters born in virtually every valley, hollow and mountain surrounding her home place in the Mabe community. From Ft. Blackmore, Rye Cove, Duffield to Bowen Mountain, Granny Hill's services were sought. Whether it be midnight or the dead of winter, she always went when needed. ones she's wearing here. This photo belongs to her granddaughter Geneva Jennings. Sometimes the long trip would be made on horseback or in a wagon or buggy, in later years by automobile, but, often as not, the journey would be made on foot. "She would go if it was pouring rain or snow. It never got too bad for her. The weather wasn't important," says my Mother (Myrtle Starnes) as she recalled Granny Hill's role as a midwife. "People could come after her saying, "Scissors, get your grip and she would be ready in a few minutes," Mother laughed. A tiny, frail woman, Granny Hill, is said to have devoted her life to bringing babies into the world and caring for the sick. She died on November 1, 1951 at the age of 95. Despite the fact he was afflicted with arthritis and sustained a broken hip in her later years, Granny delivered babies up until the last six years of her life. Mother and Aunt Helen recall she delivered her last baby, born to the Ovel DeRossitt family, while sitting in a chair. Granny Hill's devotion and persistent nature to disregard her own well being to help others was a source of concern to her children and family. "She would walk for miles during the coldest time there ever was," recalls my Mamaw Starnes, as she talked about her mother. "Ike (Mamaw's brother) and I would fuss at her because she would go but you couldn't keep her from going." But underneath all that concern Mamaw could understand why Granny Hill could not refuse anybody. "If you've got a job and can help someone when they are suffering you would have to go," Mamaw reasoned. Among the many who have fond memories of Granny Hill is Mrs. Charlie "Aunt Gay" Bowen. "She was so kind, patient and sweet; I wouldn't have anybody else," says Aunt Gay as she recalls how Granny Hill showered her with love and attention when delivering three of her children. "She would come and stay two or three days or even a week if needed. I don't know what people would have done without her," Aunt Gay declared. "Aunt Annie was very dear to me. She was like part of the family. She was so glad to help everybody. "Aunt Gay reflected upon the birth of one of her sons, Jerry, which took place in March following a terrible blizzard. The severe storm leveled barns and blew the roof off the Bowen's house in the Rye Cove area. "The snow was so deep Charlie had to go get her on a horse. He couldn't get there in a car," Aunt Gay says, adding that Granny Hill rode astride the horse on the return trip. According to Aunt Gay, after the birth of a child, Granny would return a week or two later to see how it was getting along. "She was a character," continued Aunt Gay who recalled attending church with Granny at Cox's Chapel. "Aunt Annie would always want to see "her babies", the one's that she delivered," laughed Aunt Gay. She remembers Granny Hill as being full of life and fun, always laughing and happy. "She always seemed old because of her dress," Aunt Gay says. "She wore real dark colors and wore her hair twisted in a bun." Her attire was typical to that of all women in those days, she quickly adds. Everyone had absolute confidence in Granny's ability, even the physician of the area, recalls Aunt Gay. "There was not a doctor who wouldn't come if she ever needed help. She was that kind of person, "Aunt Gay said. A licensed midwife, Granny Hill received her training from her father-in-law, "Doc" Hill, an old timey herb doctor and Dr. C. R. Fugate, a well known Clinchport physician. Mamaw Starnes recalls accompanying Granny Hill into the mountains to gather herbs and ginseng as does Mrs. Echol "Bonnie Hill" Smith of Yuma. "Aunt Annie really knew where to find ginseng," says Mrs. Smith. "She would always come out with her apron full." Mrs. Smith, remembers that Granny also gathered yellow root or golden seal which she would boil in water. This mixture was used to treat the pink eye. "It would cure it right now," Mrs. Smith declared. Mamaw Starnes says that her mother would boil the herbs and mix them with apple brandy, which she made, in order to purify them. Omer Fields says that Granny would gather wild cherry, white oak, elder bark, wahoo, burdock root which were boiled until real thick. She would roll the thick mixture into pill form, dip the pill into flour and place in a container. There was a certain way in which the bark had to be gathered Omer says. "If it was skinned down it would 'clean you out' if up, it would make you sick and you would vomit," he said. "Granny Hill could always tell by looking at bark which way it had been skinned." During her long career, which included the delivery of a couple sets of twins, Granny Hill never lost a baby or had a mother to die during childbirth. Only once did she request that a doctor be called. On this particular occasion the baby was turned wrong and Granny Hill was concerned that she might not turn it right, Mamaw Starnes recalls. The physician called to the scene was Dr. Bob Lynch of Natural Tunnel who proceeded with the delivery. "After the baby was born he told Mommy she could have done it herself," adds Mamaw. Granny Hill kept a close account on all the pregnant women within a wide radius of her home. Each time she would hear that someone was expecting a child she would remember the date. She would count the months, set the date of the delivery which was usually correct. "She could tell you how many babies would be born in the summer or whatever season," laughed my Mother. On some occasions, Granny Hill would go to the house a few days before the baby was due. She did this because she knew, from past experience with a particular lady, that she might have a difficult delivery. "I've heard people say she would go and stay from three to four days with some women," said Geneva Jennings as she reflected on her grandmother. "She was really concerned and knew those that needed to be watched closely. She always knew what to do the next time," said Geneva. 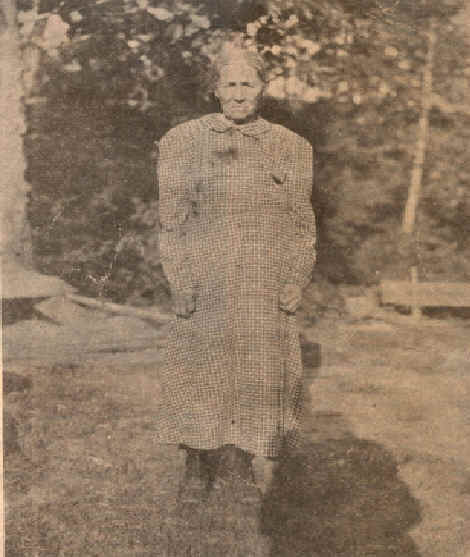 Granny Hill delivered Geneva's first child, Junior, and by coincidence she delivered his wife, Barbara Bowen, whose parents resided in the Bowen Mountain area. Whenever Granny was called to a house to deliver a baby, the youngsters were quickly ushered away. As was pointed out earlier, child bearing was never discussed with children. One person relating such an occasion was Joan Jessee, "I remember Daddy going to get her. (Granny Hill) when Tom was born. Mommy told us to go to Grandmaws. I kept asking where the baby was and she told me it was beside the creek," Joan said. She quickly ran outside and ran up and down the creek bank but no baby could she find! She ran back into the house to report there was no baby anywhere! "Grandma said it was in Granny Hill's little satchel. I told her to 'look inside to see if it was a girl and if it was an old boy she could take it back up to Mabe!" laughed Joan as she pointed out that she wanted a sister. Joan, who along with three other children born to Charlie and Ann Shepard delivered by Granny Hill, was fourteen years old when she learned where babies came from. From several other accounts Granny appeared to have been looked upon by children as a carrier of bad tidings instead of bundles of joy. It seems Aunt Helen's brother, Crawford didn't want a brother or sister either. Their mother, Mrs. Jess (Maxie) Stanley, laughingly recalls she had to give him a spanking when he hid in the bushes, preparing to throws rocks at Granny Hill as she approached their house. "He didn't want her to leave a baby," chuckled Maxie. Maxie remembers an incident in which Granny Hill's services were needed almost simultaneously. 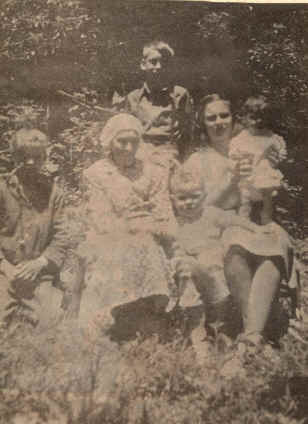 "One of Mrs. Omer Hilton's babies was born one March when there was a foot of snow on the ground. It had poured all day long. Aunt Annie worked 2-½ hours to deliver that baby. While she was there, word was sent by Jess Stone that she was needed at the John Stallard's. She left as soon as she could and delivered the Stallard baby all in one day. Maxie smiles as she remembers her husband gave John Stacey a half gallon of apple butter to deliver word to Granny Hill that she was needed at their house. A birth was a big affair in a community; one in which all the neighboring women came to the home to lend a hand. The ladies would hold the expectant mother's hand as well as just providing moral support; and boiling gallons of water. "The stove had to be fired up no matter how hot the day was, Geneva said. Cleanliness was important to Granny Hill who always washed her hands with a disinfectant soap she carried with her. After the baby came Granny would cut the umbilical cord with her tiny scissors then tie it. The other women would bathe the mother and provide fresh bed clothes while Granny would devote her attention to the newborn child. She would bathe it, put drops in its eyes then focus a great deal of attention to the care of the baby's naval. The following ritual was performed to keep the naval from "rupturing". A piece of pre-washed white cloth was scorched over the fire to be placed on the baby's navel. A hole was cut in the cloth to allow the naval cord to be pulled through. The naval cord was covered with castor oil to keep it soft. Since talcum powder was an unheard of commodity in those early years. flour was parched over a flame and used on the baby's naval until it dried. "You had to wait until the baby was three months old to quit putting bands on," said Geneva. skirts as well as sheets were fashioned into three corner diapers. If the weather was cold, long socks would be put on the baby's legs and pinned to its diaper. Another person who has a vivid recollection of Granny's ability is Mrs. Ormer (Ethel) Fields whose three children were delivered by the beloved midwife. Ethel recalls the birth of her youngest son, C. J. who weighed only 3-½ pounds, "We didn't think he would live but Granny Hill told us not to worry. She put him in a box lined with cotton. She didn't wash him with water, she bathed him in oil," Ethel said. Granny Hill would return to the Fields' home every day to attend the tiny baby. "She didn't want me to get him out of the box," Ethel adds. She recalls that Granny Hill would boil sugar and water, let it cook, pour a little bit into a spoon, put the mixture into a tiny dropper from which the infant received the liquid. Ethel says Granny Hill would always test to see if a baby was "liver grown." "She would lay the baby flat on its back. If its right foot would touch its left hand they would not be liver grown. If it wouldn't touch it would be." To remedy the situation Granny Hill would lay the baby down, pick it up by the heels and turn it over and over at least ten times. This was supposed to cure the baby. "She always checked under the baby's tongue to see if it was tongue tied. She had little scissors she used to clip if it wasn't right." Ethel said. If an infant suffered from diaper rash, Granny Hill would brown flour in a big iron skillet then dust it on the baby, Ethel recalls. Both Ethel and Omer spoke very highly of Granny Hill pointing out that she always went whenever called upon. "People would go after her on horseback. They would lead the horse back and let her ride," recalled Omer. Another neighbor, Theodore Shupe described her as being "the most remarkable person he had ever known." "She was really an angel of mercy for the whole community. She could help in any kind of situation," Theodore praised. Granny delivered four of his and Myrtle's children. Theodore, who always called her "Granny Scissors", said that anyone in need of her services during the day time would have the message relayed by Charlie Shepard as he delivered the mail on horseback. "During any kind of sickness they would always send for her. It didn't matter what she was doing. She would drop it right there and go," Theodore recalls. "I never did hear her mention any pay for it in my life," he adds. Based upon all information, Granny most often was given either $2 or $5 for her services. In later years, as times 'got better', she received $10. However, on numerous occasions, she received no pay whatsoever. Theodore recalls a further example of her generosity as he remembers that Granny Scissors had a big apple orchard and she would invite neighbors in to get all they wanted. "She was one of the most honest people I ever knew," Theodore vowed. "I never did hear of anyone speaking ill toward her." Among the collection of memories of Granny Hill the most amusing ones were related by my Dad (Otis Starnes). It seems Daddy and his younger brother, Frank would always run and jump into Granny's bed. Despite all her pleas for them to quit, they would not. Well, Granny went out and cut a big branch from a rose bush which was literally covered with razor sharp thorns. She gingerly placed the branch under the sheet on her bed. "We ran and sailed right in on it," laughed Dad. Needless to say, it was their last plunge. With a big grin he told how she would get he and Frank to take a dose of Black Draught. She would place the powered medicine on the oil cloth on the kitchen table. She would then tell the boys they could play like they were horses and that the medicine was their food. Everyone knows horses like salt! Anyway, Dad and Uncle Frank would gallop through the house, run up to the table and lick the medicine off. "It would tickle Granny Hill to death," Dad roared with laughter. Everyone I talked to whose children were delivered by Granny Hill said they wouldn't have had anyone but her. Mrs. Lucy Shepard's comments are typical: "She was the best there was." Lucy recalls Granny treaded a knee deep snow when one of her sons, J. D. was born in February and how Granny would returned every day to take care of another son, Junior. "We lived close to her then and she would come to stay and help me at night," Lucy says. She recalls that Granny always gave the new born babies a dose of castor oil, the size of a dime, to keep them from having the colic and to clean them out" as soon as they were born. Lucy also remembers that Granny delivered eight children to Lilly and George Kern, nine to Lilly and Ben Dillon, three to the Ernest Fletchers. Most couples in those days had large families averaging anywhere from a half dozen to a dozen and Granny Hill delivered most, if not all of these children. Considering the fact Granny Hill was called upon to deliver so many youngsters it would appear she had no time for anything else. This, however, is a very wrong assumption. It seems Granny Hill operated a grist mill which many of the people interviewed remembered very fondly. "We took corn there in a big sack to have it ground," said Aunt Gay. "Everybody from all around went over there. " Her son, Jimmy, better known as "Cotton", recalls riding to Mabe on a mule many times to get corn ground. His memories include that of fishing in the mill dam. " Aunt Annie would quit grinding and get some flour and make dough and help me catch fish. They wouldn't be that long," laughed Cotton, measuring the length of his index finger to indicate minnow size fish. Both Omer and Theodore recalled the measures Granny took in order to have enough water to power the mill during the dry summer months. "She would put a grate over the race to catch the water," Theodore explained. Omer, who rode three miles on horseback to the mill, said it would take two or three hours to "get a turn of meal ground" when the water was low. "We gave her a little cup of meal for every turn of corn for her pay," Omer said, explaining that was the common practice in those days. "Water ground meal is the best. It gets too hot now," Mrs. Smith recalled. Theodore further remembers that Granny always kept three to five cows as well as tending a flock of sheep. "I don't remember anybody but her shearing them," he said. "She would send the wool to Walter Rollins' in Rye Cove. Salesmen would come there and pick it up." Granny Hill's husband, Elisha operated a sawmill, which Theodore said was considered men's work. "The menfolk worked at it and did the farming. The womenfolk ran the gristmill and tended the garden," he said. Granny Hill is pictured with her grandson. Thurman Hill on the left. Wise. The photo belongs to Mrs. Echol Smith.